The event “Kings of the Hill” has just ended yesterday after a crazy race to the top in the last hours. It was an intense competition and we have been so excited to feel the heat of that. We cannot wait till the next one! Congratulations to all prize winners (see table below for detailed ranking)! 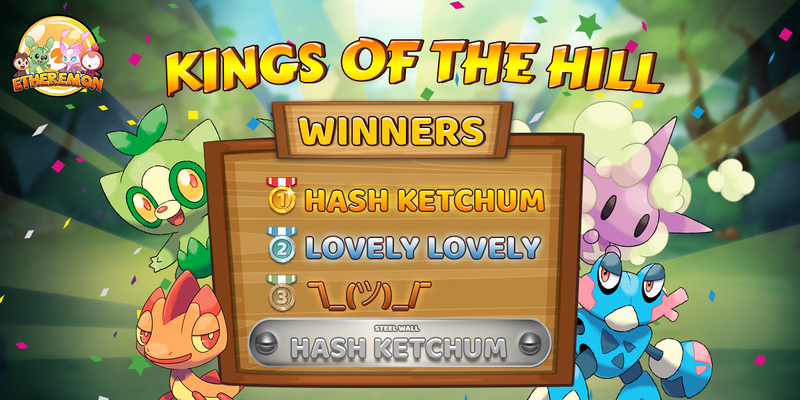 The honourable Steel Wall prize belongs to Hash Ketchum, who managed to stay at #1 for over 9 days. ◕ Mon skin will be awarded once the feature is released (expect Q2 2019). ◕ Mon reward will be the next Mon to be released in the game. ◕ EMONT reward will be transferred by 25 March 2019.